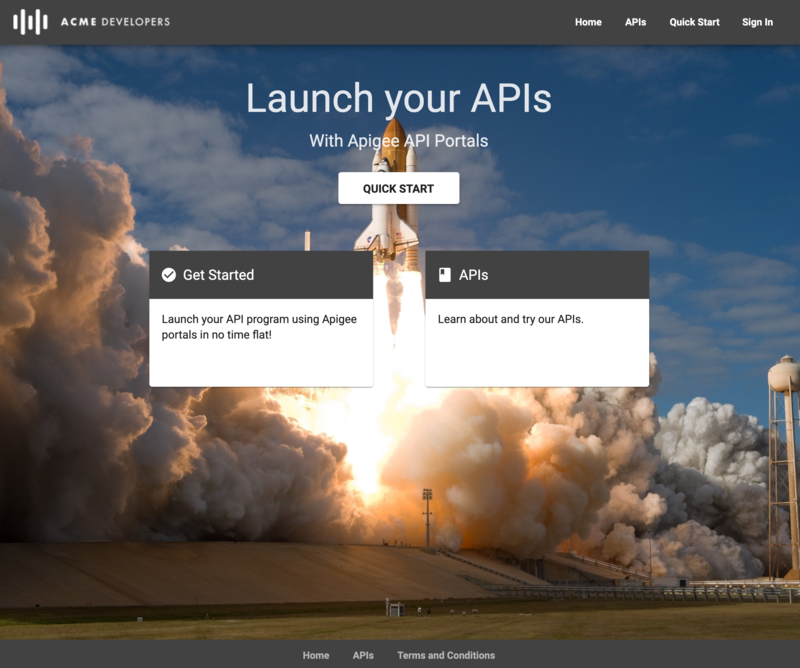 Apigee Edge delivers a simple-to-use, integrated portal to document and manage access to your APIs, and foster your API developer community. All users of Apigee Edge have access to the integrated portal development tools enabling them to build their own developer portal quickly, providing an alternative to the Drupal-based portal development. For a feature comparison, see Comparison of developer portal features. Portal content development Develop your portal content quickly and easily. Portal look-and-feel Fully customize the look-and-feel of your portal using SCSS style sheets and personalized branding. API documentation Auto-generate API reference documentation based on your OpenAPI Specifications. Self-service registration Provide self-service registration for developers to build apps using your APIs. Analytics Configure Google Analytics and custom analytics tracking. When you create a new portal, a set of starter pages is provided for you to use as a jump-off point. The starter pages contain demo content to help inspire your own portal development as you replace the text and images with your unique content. The sample portal theme uses material design theming and SCSS. The following shows the home page of the sample portal. Home Portal home page that describes the APIs that are showcased. Serves as default home page for your portal (index.html). Demonstrates use of angular material components, as described in Add angular material components. Quick Start Set of quick start steps that demonstrate how to customize the portal. See Step through the quick start. Get Started Sample content page. Learn how to edit this page and add it to the top navigation by stepping through the quick start. APIs List of available APIs. When you generate interactive API reference documentation, links to the content are added to this page automatically. Note: The contents of this page are auto-generated based on the APIs that you publish to your portal. You cannot edit the contents of this page directly; it does not appear in the pages list. You can modify the styling of the page using the portal theme editor. My Apps List of registered apps for an authorized user. See How app developers interact with your portal. Note: The contents of this page are auto-generated based on the registered user apps. You cannot edit the contents of the page directly; it does not appear in the pages list. You can modify the styling of the page using the theme editor. Sign In Sign in page for registered users. New users can register from this page by clicking Sign up. See How app developers interact with your portal. Note: The Sign In page is included in your portal automatically. You can customize the logo on the Sign In page and add custom registration fields to the Create Account page. You cannot edit the contents of the page directly; it does not appear in the pages list. Terms and Conditions Sample terms and conditions page.